NCA’s first collaborative project is with the Presbyterian church in Riberas del Pilar. This initiative was started by NCA’s former Secretary Amy Friend and our Past President Bill Friend. Bill and Amy have been attending services at the church for many years. The Presbyterian church as two congregations, with services in Spanish and English. NCA worked with Pastors Ross Arnold and Guillermo Pérez-Banuet Zamora to put this collaborative project together. Pastor Guillermo worked with his Spanish speaking congregation to put together a group of students whose families are in a difficult financial situation, and who need the sponsorship help in order to be able to stay in school. He provided this list of students to our team who interviewed the families of these students. and our goal to see students from whatever grade they are entering our program through to graduation. Immediately following the presentation, we had seven students sponsored, the most ever in one day! We also had interest expressed by many for sponsoring students that live close to where they live, and interest in following up later with other sponsorships, so there may be more to come. NCA wil be holding its AGM at 2:00 on the 2nd of March. The meeting is scheduled for 2:00 pm, with registration starting at 1:30. NCA’s Volunteer English Language Teachers, students, and board members. On Saturday, the 12th of December, NCA held a posada at our chapala office to celebrate our volunteer teachers and students who take English Language classes in the computer lab at our Chapala office. Tamales and Atoles we served to all in attendance. 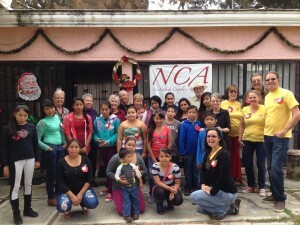 The NCA board would like to express a big thank-you to Lilia and Karla who put together the Posada. Your NCA Board has been busy with a flurry of wide-ranging activities. One continuing incentive has been to increase our public profile, and the positive fallout from this becomes increasingly evident. 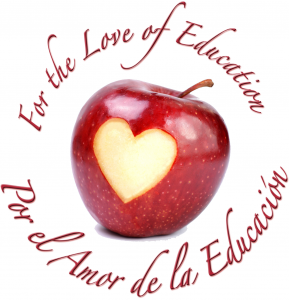 The local press, El OJO del Lago and The Guadalajara Reporter, feature our organization at least twice monthly, with various news articles and photos plus the “Student of the Month” column. In particular, these serve our central purpose, attracting new sponsors to support our wonderful students and keep them in school. New sponsors now step up spontaneously every week. The NCA office will be closed for the holidays. The office will be closing on Friday Dec. 25th and reopen Monday Jan. 4. There will be no English classes on the two Saturdays during the holidays. The NCA brochure is in need of updating. Director of Events, Shannon Blair and Secretary, Amy Friend are tasked with this initiative. The amended text will be submitted to the Webmaster, Doug Friend, for integration with our new logo and fresh artwork. 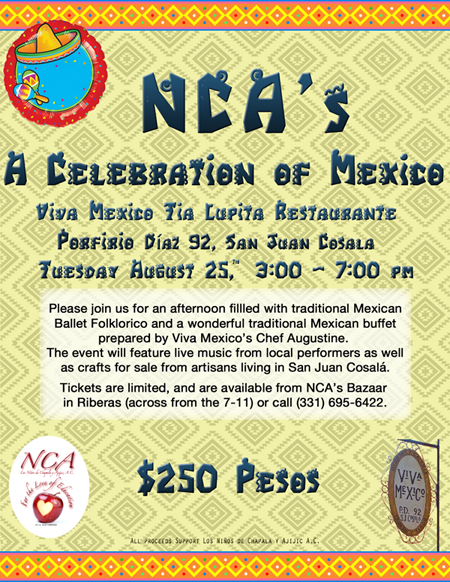 NCA conducted its second Celebration of Mexico at Agustin Vasquez Calvario’s Restaurant Viva Mexico Tia Lupita in San Juan Cosala on Saturday, August 25, 3-7 p.m.
A lavish buffet of iconic Mexican dishes was offered. Guests enjoyed live entertainment, highlighted by area musicians and singers exhibiting a sampling of the Republic’s traditional songs, plus a few from the US. All proceeds from the event will support NCA and the hundreds of gifted students who continue their education through the generosity of supporters. The East Indian Dinner Event was a great success. We thank all our sponsors and friends for their attendance and support! The garden was filled with lots of laughter and conversation as our guests enjoyed the scrumptious meal prepared by NCA Board members and volunteers. Every dish was truly worthy of a 5-star restaurant. And the Margaritas were to die for. Who knew there was so much culinary talent in our midst! By popular request this will become an annual event, so if you missed it this year, be sure to get your tickets early for next year’s event. 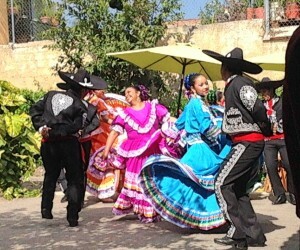 The event made approximately $20,694.00 pesos profit. 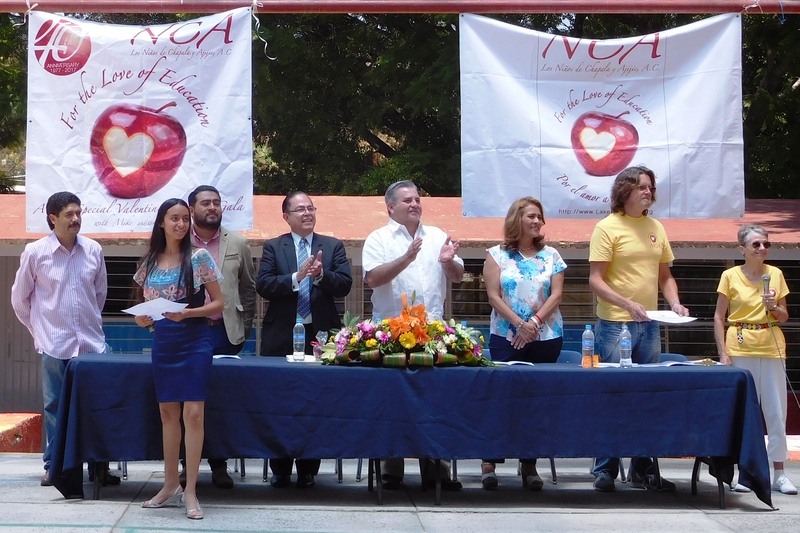 On the initiative of Nancy Allan, Treasurer, NCA will host a modest Posada December 12, to honour the five volunteer English teachers and 20 students involved with NCA’s English classes program. Tamales and Atoles: should be fun for all! The page is maintained by Director and Webmaster, Doug Friend, and will be regularly updated with NCA news and upcoming events. Past “Student of the Month” columns were requested from the OJO and forwarded to the Webmaster and have been integrated into our website. Each Board member will review the NCA website monthly, and forward any suggested updates to the Webmaster. Kenia and Carla, our wonderful office staff, are also involved in this activity. Director at Large, Nicole Belinne, is collating the Quarterly Newsletters, to which all NCA board members will regularly contribute. Note: Check out the last posted Minutes (Nov 3, 2015) for full details! You can view your student’s account on the website via your personal password. Please Note: new office hours are 3:00 pm – 6:00 pm. Telephone remains unchanged (376) 765-7032, where you can talk to Kenia. Despite a quiet summer at the bazaar, with average monthly sales between $8,000 -$11,000 pesos a month, high season has arrived! Sales and donations are picking up and the staff is getting ready for the holidays. 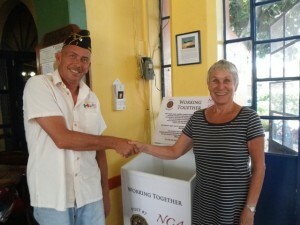 Please consider NCA when making donations and keep in mind that we offer an economical 20% fee on major consignments. We will be printing a new large banner for the Bazaar that will be in tune with our new logo, font, and tag line “For the Love of Education”. The sign will be back-lit at night, and should draw the attention of passing motorists. In September, Mtra. Cony Larios and Director at Large, Susan Johnson visited Lakeside Presbyterian Church to deliver mugs and pens to Pastor Ross and Pastor Guillermo in appreciation for the Church´s generous support for students through NCA. 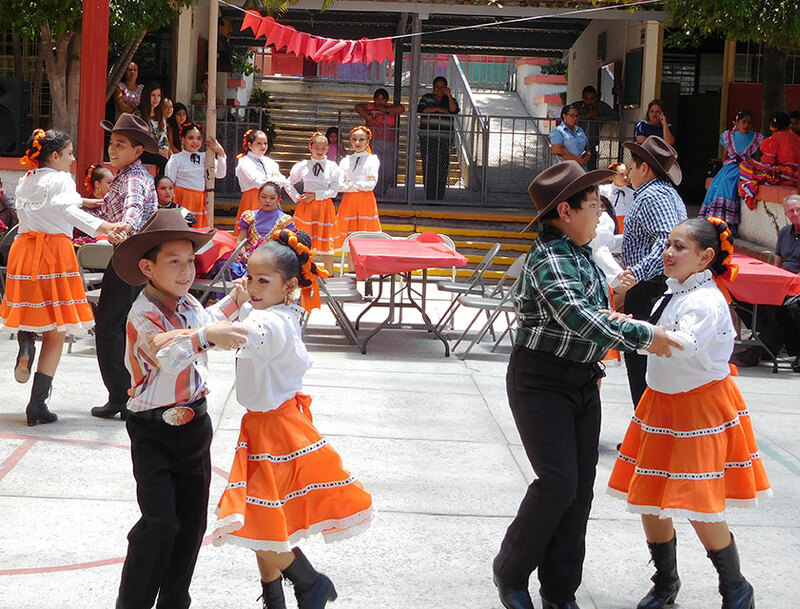 They also discussed possible dates for performances by the folkloric dance group Macehuani from public school Primaria Ramón Corona. 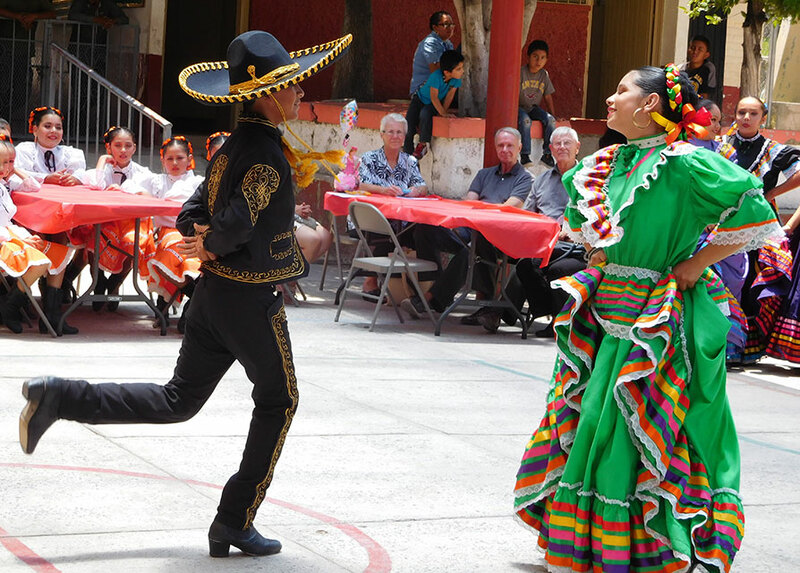 Director at Large, Susan Johnson, organized and served as Mistress of Ceremonies for a performance by the folkloric dance group Macehuani group at St Andrew´s Anglican Church for the celebration of Mexican Independence. NCA Student Liaison Lilia Quezada, presented Father Winston Welty with an NCA mug and pen in recognition of the support provided by the church. She also explained the mission of NCA to keep more students in school by recruiting new sponsors. 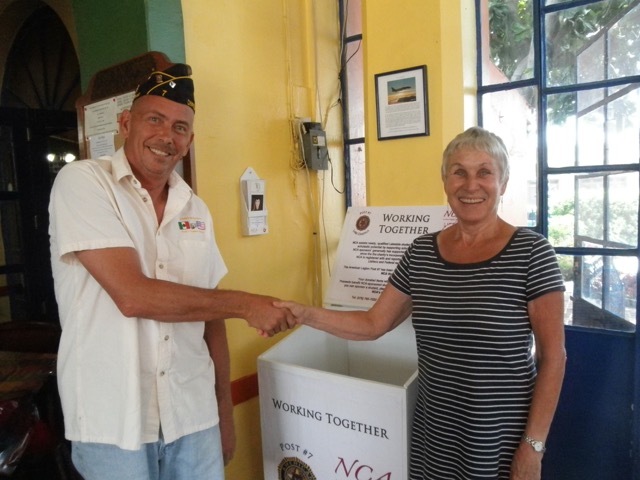 In response to an invitation by Ajijic Rotary, NCA Director at Large Susan Johnson is coordinating and will serve as Mistress of Ceremonies with School Zone Supervisor Mtra. 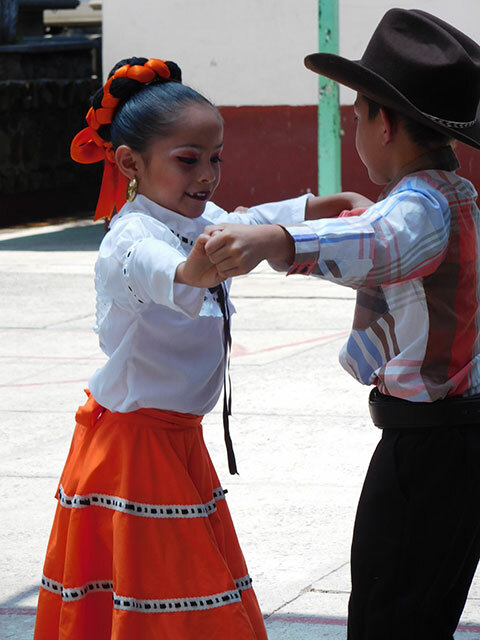 Cony Larios, for a presentation by the folkloric dance group Macehuani from public primary school Ramón Corona. 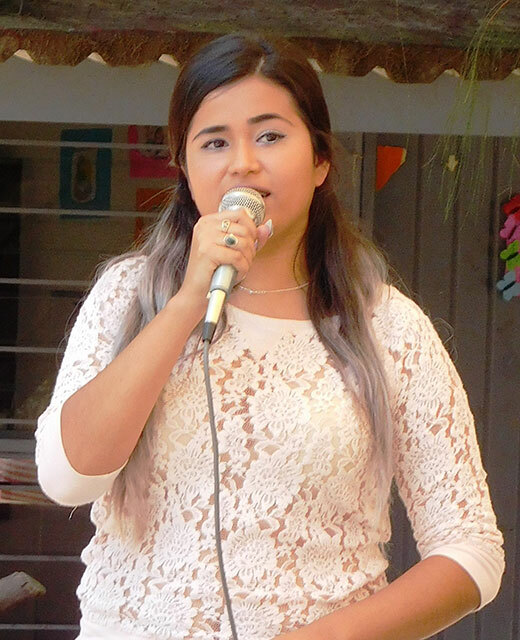 Student Liaison Lilia Quezada will explain the mission of NCA during the December 8th program at the Real de Chapala. Susan Johnson, Director at Large, and Student Liaison, Kenia Sánchez, were presenters at the Lake Chapala Society´s First Annual Scholarship Summit on November 11, 2015. The purpose of the summit was to share information in order to establish communication and collaboration. Vice-president, Dr. Tim Whiting, and Director at Large, Susan Johnson, represented NCA at the Lake Chapala Society´s 60th Anniversary Celebration on November 7th. NCA is tentatively scheduled to be present at LCS the 2nd Wed of every month, starting December 9, 2015. 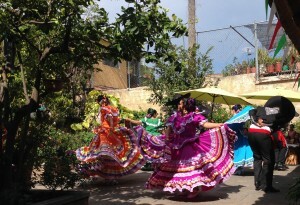 Please join us for our second annual Celebration of Mexico at Chef Augustine’s fabulous Viva Mexico in San Juan Cosalá. 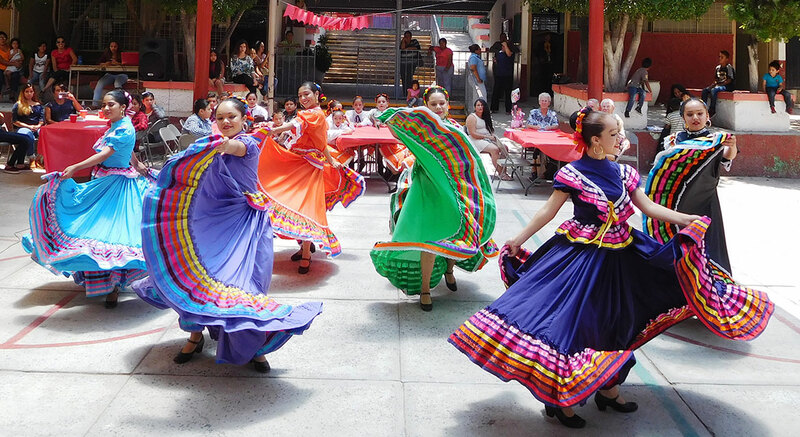 Chef Augustine will again prepare a scrumptious buffet for you to enjoy, and we will have live entertainment, feature traditional Mexican Ballet Folklorico. Tickets are still only $250 Pesos, and all proceeds from the event of course go to support NCA and our gifted students. Tickets will be available at NCA’s Bazaar in Riberas del Pilar (across from the 7-11), or call our wonderful Events Coordinator Shannon at (331) 695-6422. See you there!